Cover: The Art Bulletin, September 2017. The impassioned figure of V. I. Lenin, addressing invisible masses from an elevated lectern of vanguard design, appears on the cover of the recent September 2017 issue of The Art Bulletin. 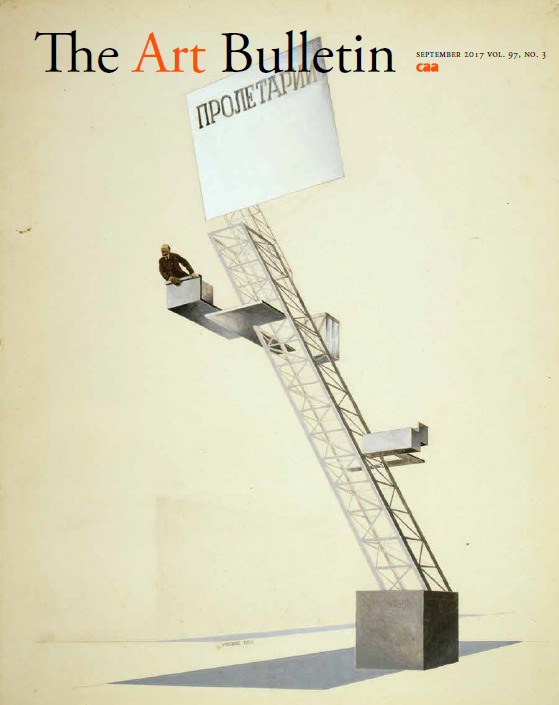 El Lissitzky’s 1924 design for the Lenin Tribune appears in Samuel Johnson’s article exploring Lissitzky’s plans for a horizontal skyscraper in light of a newly discovered drawing. In other essays featured in the issue: Anthi Andronikou traces a transcultural artistic vocabulary across the eastern Mediterranean in religious paintings of the thirteenth century. Fabio Barry considers how early modern artists from Siena to Oxford used chemical means to infuse seemingly miraculous images in marble. Morten Steen Hansen’s essay subverts the assumption that Francesco Furini’s Baroque allegorical frescoes for the Palazzo Pitti served primarily as panegyrics to his patron. Ebba Koch examines the political underpinnings of intricate illustrations commissioned by Shah Jahan, the builder of the Taj Mahal, to illustrate historical narratives. And Gavin Parkinson uncovers the sway of the Surrealist André Breton in the reception of Georges Seurat’s Impressionist paintings. The reviews section, on the theme of “Craft, Industry, Design,” encompasses recent books on early stone carving in India, debates about nineteenth-century art, craft, and industry in the British Empire, the development of American design culture as seen through the lens of the industrial designer John Vassos, and the gendered role ceramics played in the twentieth-century American avant-garde. CAA sends print copies of The Art Bulletin to all institutional members and individual members who choose it as a benefit of membership. The digital version at Taylor & Francis Online is available to all CAA individual members regardless of their print subscription choice.